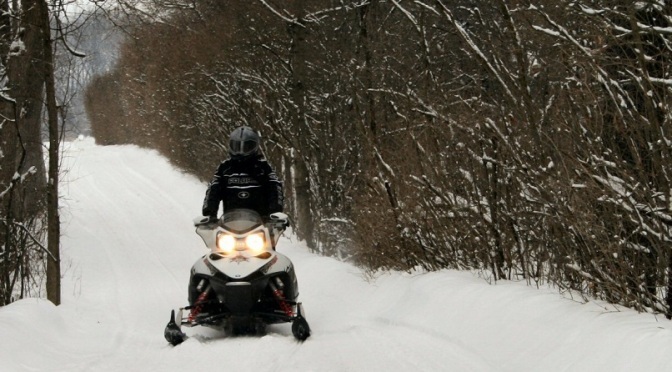 Pewaukee Moon Shiners Snowmobile Club | Pewaukee area snowmobile club helping to maintain trails, promote the sport, snowmobile safety and helping our community. Welcome to the Pewaukee Moon Shiners Snowmobile Club. We are a group of people who enjoy snowmobiling and are dedicated to promoting the sport and maintaining the trail system in Pewaukee and Waukesha County. It takes the help of snowmobile enthusiasts, like yourself, to keep, build and maintain the snowmobile trail system each winter. By joining the Pewaukee Moon Shiners Snowmobile Club you will be providing future generations with access to a great trail system in Waukesha County. Without the volunteer help from club members and the landowners who allow trail access each winter, this sport would not exist. Your club membership also qualifies you to receive a discount when purchasing Wisconsin’s new trail pass. Visit our trail pass page for more information. The Pewaukee Moon Shiners was originally founded during the winter of 1970-71 when snowmobilers first started organizing and developing a trail system. Though the efforts of these early snowmobilers is the reason Wisconsin has one of the best trail systems in the country with over 25,000 miles of groomed trails throughout Wisconsin. Currently, the Moon Shiners help maintain the last snowmobile trail connecting Pewaukee Lake to the “Bug Line” trail in Sussex. This gives area snowmobilers access to the county’s 135 miles of interconnecting trails. Our club also supports the Waukesha County Snowmobile Association’s youth scholarship fund, promotes snowmobiling and snowmobile safety and charitable efforts in the community. Individual membership starts at just $30 per year. To become a member download a copy of our membership form or send us an email. Membership fees help each club pay for trail maintenance, grooming and trail insurance needed to keep the trails open each year. If you are an avid rider or a first time rider your club membership is important. Clubs support snowmobiling initiatives locally as well as on the state level. If you enjoy getting out on the trails each winter, please join Pewaukee’s Moon Shiners Snowmobile Club today! United We Trail…Divided We Fail.